Do animated pirates float your boat? How about pixellated belly dancing genies hmm? Do they rub your lamp the right way? Are you enjoying this suggestive set of questioning? Here’s hoping or else a fair amount of the stylistic weight and innuendos from Shantae’s third outing will be lost on you. First came the Game Boy Colour’s Shantae, then came the DSiWare’s Shantae: Risky’s Revenge and now we’re here. Personally this is my first runaround with the half-genie so apologies to all you Scuttle Town enthusiasts out there in advance. “Shantae, you stay!” Words of wisdom from a famous drag queen. What struck me right in the chops from the “ret-2-go” (confused? please don’t be, it’s Shantae’s language) is that this game stays true to its WayForward ilk. Having played the likes of Mighty Switch Force! and Regular Show: Mordecai and Rigby in 8-Bit Land etc. here we have another visiting yesteryear trickster of a platformer rewired with 2010+ bells and whistles. These games rarely need to be taught, you should find your digits auto-piloting directly to the D-Pad (or analog stick if that’s more your bag) and jump button posthaste. Okay so there’s a little more to it than that as far as the Pirate’s Curse is concerned, but if you love yourself some run-jump-attack-explore-upgradin’ a la Metroid your lamp will be floating no doubt. The story plonks you right back in the thick of it characters ‘n’ all regardless of your homework. To the point then; here you play as a magically numbed genie who teams up with their swashbuckling adversary to sail to cursed islands to purposely seek out their local Dens of Evil. Basically anchor up to hair whip through or leap over respawing baddies whilst fetch-questing to the island’s ‘dungeon’, obtain a new ability like a pistol, beat boss, nab the next island’s map, repeat! What makes this a pleasure to play is the game’s nurturing mechanics, smirk inducing jest, jostling sprite art and hum happy Middle Eastern beats. I found myself on most occasions tittering away, that or shimmin’ my rump off to the polished bass-lines whilst adding to my collection of Heart Squids (collectibles to buff your health limit). With the realisation of my charmed state striking in a particular section on the undead themed Spiderweb Island. The bit where you have to carry the manipulative zombie Rottytops. Music and wit cylinders firing as each 2D traverse tested my input reflexes with its many tongue traps and what I presumed to be over friendly robots. For those interested the Wii U GamePad blends in nicely acting as your inventory, key items and map. Fancy a swig of some Super Monster Milk? It’s just a fingerprint away. The map selection screen also has a nice pirate wheel ‘touch’. With the off TV play option making an appearance as well to defuse those living room feuds. 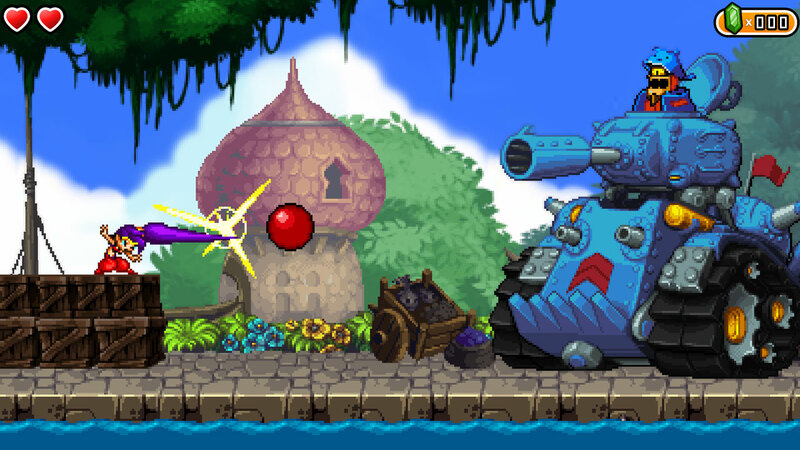 During my time spent with Shantae and the Pirate’s Curse I couldn’t help but feel a niggle that the previous installments are a must for context, so let that be a warning to all series skippers, and a sorry yet again to Scuttle Town fans! As a package it doesn’t do anything gobsmackingly different, but don’t mistake that for a negative. What it does do is make a rather pleasing effort at its chosen new retro thoroughly aware of all its predecessors and influence. Do you like a game that takes the Mickey out of its set pieces? Even if this means jiggling with the tired video game trope of enhanced female assets? Make sure to save and upgrade often then Shantae take three will surely swab your deck with a genie’s wish worth of fun! Shantae and the Pirate’s Curse is out today in Europe as a Nintendo eShop exclusive with a cross-buy discount for both the Wii U and 3DS. This Nintendo Scene Impression wouldn’t have been possible without a Wii U press copy kindly provided courtesy of WayForward Technologies.